Spring is here, and for many AEP employees, spring brings another welcome season of fishing. The 20th annual AEP employees´ team fishing tournament will take place from 6 a.m. to 2 p.m. June 4, at Seneca Lake southeast of Cambridge, Ohio. 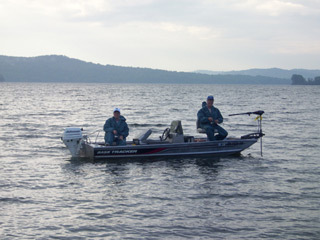 Twenty-seven teams of competitors in the 2010 AEP employee fishing tournament at Seneca Lake enjoyed the day. The one-day tournament -– an event organized by employees -– is open to all AEP employees and retirees. At least one member of each two-person team must be an employee or retiree. Seneca Lake, situated in Guernsey and Noble counties, is the third-largest inland lake in Ohio and is one of Ohio’s top boating and outdoor attractions. The lake is managed by the Muskingum Watershed Conservancy District and is home to populations of largemouth, white and striped bass, walleye, yellow perch, crappie, bluegill, bullhead, and channel and flathead catfish. All money collected in entry fees is returned to the winners in prizes. In 2010, 27 teams from 20 AEP work locations competed for more than $2,856 in prizes. A representative from each team must attend the pre-tournament meeting at 6 p.m. Friday, June 3, at the Seneca Lake shelter house 3. Conesville Plant is proud to be able to host the pre-meeting and dinner. Entries will be accepted up to the June 3 pre-tourney meeting. Pre-registration is encouraged by Wednesday, May 4. Additional tournament information and entry forms may be obtained by contacting Sherra Swope at audinet 288-4102 (outside: 740-829-4102) or Ken Fulks, fishing tournament coordinator, at 740-683-2557. Employees at Public Service Company of Oklahoma (PSO) have already been out fishing for more than a month, as the Electrified Bass Fishing Tournament Trail’s first event was held March 5 at Tenkiller Lake, followed by an event April 2 at Grand Lake. The tournament trail, which consists of bass fishing tournaments at a number of Oklahoma locations, is open to AEP/PSO active and inactive employees, their immediate family members and approved contractors. Upcoming events are April 16 at Lake Eufaula, May 7 at Lake Hudson, June 4 at Fort Gibson Lake, July 15 at Lake Eucha, Sept. 17 at Arkansas River, and the tournament Classic Oct. 15-16 at Fort Gibson Lake. The PSO team of Mark and Timmy Troxell show their winning big bass at the Grand Lake tournament. 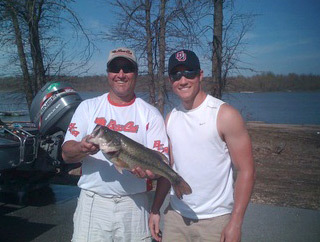 1st place overall/1st place big bass — Mark and Timmy Troxell, 19.79 pounds overall, 5.49 lb. bass. 2nd place — Richard Myers, 16.64 lbs. 3rd place — Tom Truelove and Tracy Rosson, 13.93 lbs. 2nd place big bass — Eric and Bill Scott, 5.3 lbs. 1st place overall/2nd place big bass — Bill Hulet and Robert Kirtly, 20.56 lbs. overall, 5.98 lb. bass. 2nd place overall/1st place big bass — Allen Mayhan and Mike Ruley, 17.58 lbs. overall, 6.99 lb. bass. 3rd place — Ryan Stinchcomb and Joey Butler, 16.7 lbs.